How To Display Instagram Feed On Website Using PHP? 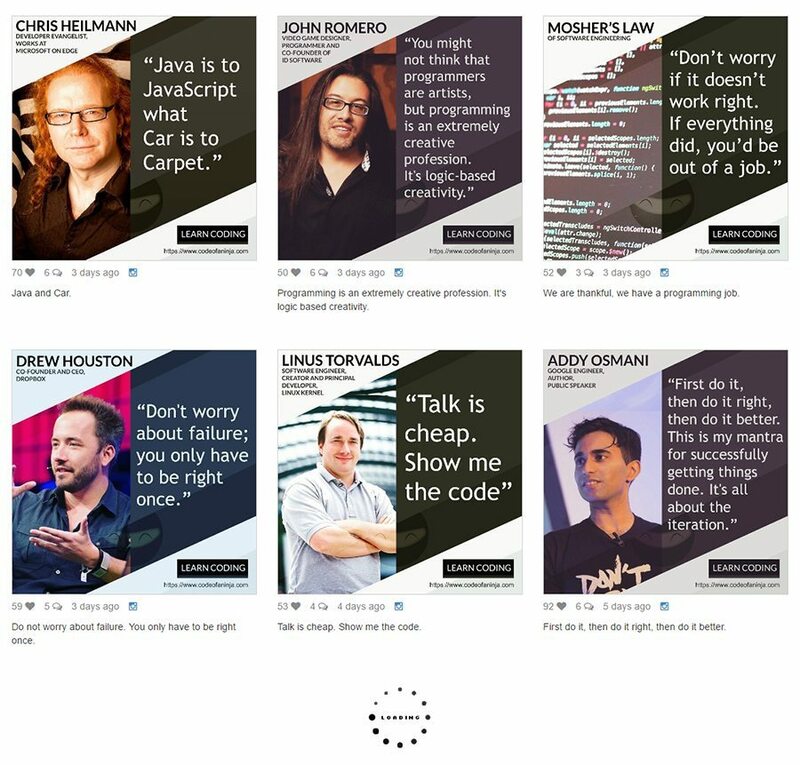 Before we start coding, you might be someone NOT interested in coding. If that's the case, you should use a website plugin like SociableKIT. Watch the following video. 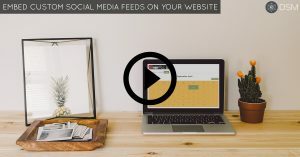 Need to embed Instagram hashtag feed on your website? Watch this tutorial. Need to embed private Instagram feed on your website? Watch this tutorial. What's next? You can try SociableKIT now, view a live demo here, here and here or continue with the code tutorial below. Do you have a photo or video manager on your website? Do you upload photos or videos on your Instagram account? If your answer is both YES, you're wasting a lot of time managing your brand's Instagram photos and videos online. What if there's a way to upload your photo or video ONCE, and then let if appear both on your Website and your Instagram account? Will you be happy saving your precious time? Our code for today will make you happy then, just like we are! Today we’re gonna talk about how to display publicly available Instagram photos and videos on your website using PHP and Instagram API. This one is great if you want your Instagram photos and videos to be shown on your website in a synchronized way. Once you uploaded a photo or video on Instagram, it will be automatically reflected and shown on your website too. 10.0 How To Display Non-Square Media? 1.3 Show some awesome UI powered by Bootstrap. If you're not yet familiar with this awesome front-end framework, see our step by step Bootstrap tutorial here. The PRO source codes has more features you might need. You can view the list of features and download them in section 11.2 and 11.3 below. For now, here's the step by step tutorial of our BASIC source code. Enjoy! To get your Instagram API Access Token, use this Instagram access token generator. This will be under the class="col-lg-12" div tag. This will be under page header. $photo_count is where you can specify how many posts you want to retrieve. $json_link is where we'll get the JSON data (photos and videos) of the Instagram user. Get the JSON data from the $json_link using json_decode() to decode it so we can loop through the contents later. I highly recommend you upgrade to PHP version 5.4+, you can ask your web najlepszy hosting provider to do it for you. Now we'll loop through the JSON data retrieved from the $json_link, and also display the images using HTML. Add the following code below the bootstrap CSS in the head section. As of September 2015, Instagram API allows us to retrieve media (images and videos) in their original (non-square) aspect ratio. By the way, special thanks to @Ed in the comments section below for helping me figure it out. Click "Manage Clients", then click "Register New Client". Both located on the upper right corner for the page. Fill out the form. In the "Details" tab, make sure you fill out the "Application name" and "Valid redirect URIs". In the "Security" tab, un-check "Disable implicit OAuth"
Fill out all other required fields and click "Register"
Once registered, it will give you a "Client ID"
Replace CLIENT_ID and REDIRECT_URL with your own and go to that URL. This will redirect you to your REDIRECT_URI. 10.3 How To Get Other User's Access Token? Other Instagram users, can use the same API client to get their access token. They need to receive a sandbox invite and accept it. 10.4 Check "Non Square Media"
Locate your API Client and click "Edit". Click the "Migrations" tab and check the box that says "Non square media". 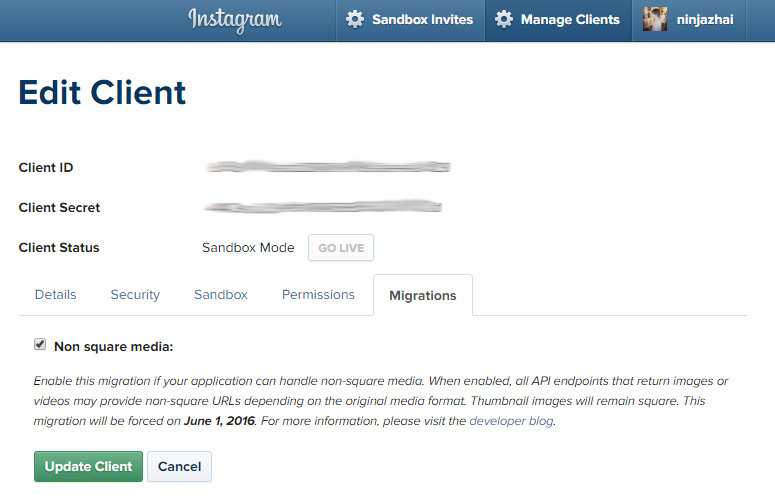 Related from Instagram Blog: Thinking Outside the Square and API Migration. You can get the source code by following the whole, well detailed tutorial above. But isn’t it more convenient if you can just download the complete source code we used, and play around it? There’s a small fee in getting the complete source code, it is small compared to the value or skill upgrade it can bring you, or income you can get from your website project or business. For a limited time only, I will give you the source code for a low price. DOWNLOAD THE SOURCE CODE by clicking the green buy button below. How to use the PRO source code? 2. Put the following code at the beginning of you PHP file. 3. Put the following code inside head section. 4. Put the following code where you want the feed to appear. 5. Put the following code before the closing body tag. Do you need more reasons to get it? Thanks a lot for supporting our website! You demanded it, we built it. A lot of people requested a website plugin version of this Instagram Feed code. Now it is available. It works no matter what website platform you use. We have tried it in WordPress, Squarespace, Wix and more. Do you use a Content Management System or CMS like WordPress, Squarespace, Weebly or Wix? 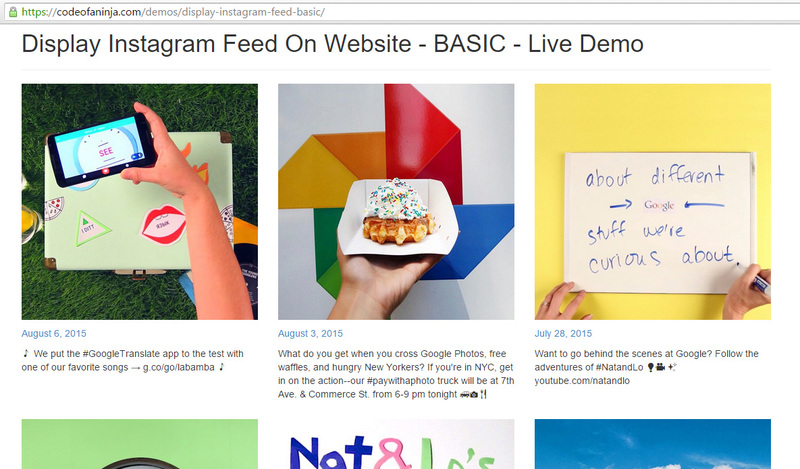 Your Problem: You need to display your Instagram feed on your website. But YOU DON'T LIKE TO CODE. Solution For You: Use SociableKIT. Why? 1. Remove your worries about coding and API updates that can break your site. 2. Fully customize the look and feel of your Instagram feed instantly. 3. Show photos and videos from your Instagram account to your website automatically and in real-time. Today we have learned how to show your Instagram photos and videos on your website. Did you know that you can also display your Twitter feed on your website? Let us go to the next tutorial: How To Display Twitter Feed on Website? 1. Subscribe to social media scripts tutorial news and updates. 2. Be updated about what works and what does not work on social media APIs. 3. Be notified for any related social media API updates. Thanks for visiting our tutorial on how to display Instagram feed on your website using PHP and Instagram API. https://www.codeofaninja.com/wp-content/uploads/2015/01/display-instagram-feed-website-1.jpg 393 750 Mike Dalisay https://www.codeofaninja.com/wp-content/uploads/2019/03/codeofaninja-with-text-3-1030x206.png Mike Dalisay2015-01-03 02:17:392018-08-02 21:50:02How To Display Instagram Feed On Website Using PHP? Hello @disqus_orqGKcOK5V:disqus, glad to hear it was very helpful to you! Thanks for your kind words! Thanks for this! Very helpful. Can we use the same access token for ever? Will it change overtime? Hello @sanojbogoda:disqus, sorry for the late reply. About the access token, only Instagram can tell if we can use it forever or if it will change overtime. For now, we enjoy that it works. Hello, do you think it is possible to buy the PRO version with at least the 3 recent comments from each instagram photo? Please let me know the price, thanks! Hello @disqus_8MxqLU3EQm:disqus, yes I think it is possible. We’ll update the pro version above with this feature this end of February 2016. I would like to purchase the pro version but we don’t have Paypal in our company. Is it possible to buy it with just a credit card? Hello @disqus_UaEBkp74Fp:disqus, thanks for your interest in purchasing our code! About your question, you can use your credit card to pay with PayPal, you don’t need to create a PayPal account if you don’t want. I got approved for basic permissions on instagram and I want to get the feed with the pictures, comments, followers, following, likes, post for my own analysis. Would your code allow me to do that? Hello @disqus_6BtDIsxQnh:disqus, we are currently working on those features. Send your email to my email mike@codeofaninja.com so we can keep you updated. Now that instagram allows portrait and landscape aspect ratios, not just square, is it possible to style this code so that it crops the images to display them as square? (The way that instagram crops everything to square on a user’s profile feed). I’m including an image of how it looks – I’d rather all the images be cropped to square if possible. Hello @Teddy, thanks for the idea! I will update the code soon. To answer your question, yes it is possible with CSS. You have to make the images a ‘background’ of your div tag. Hello @disqus_CPunhLEVgZ:disqus, thanks for reporting, we are working on the new update. We will update the code soon. Great article, thanks for sharing. One question. How do you get around the new rate limit of 500 requests per hour? Hello @sevensoutbill:disqus, glad you liked our article! About your question, we don’t have a workaround for it yet. We’ll try to find out if it is possible to bypass the new limit. Hey Mike – Here’s what we did. We cache (save json) for an initial request, then any requests for the next 15 sec are served the cached data. After 15 sec we allow another request and refresh the cached data from Instagram. @sevensoutbill:disqus , awesome, thank you for sharing your solution with us! Hi Now that the api for Instagram has changed, where can I find the user id or can we use username instead? Hi @amadhav1:disqus, for now we cannot use usernames, only the user with specified access token. Please see the updated tutorial above. Thank you for a great simple tutorial, had a custom version up and running in no time. Hello @d@disqus_1rKIRNDjHJ:disqus , glad it works for you! Your page looks cool, would you share the link to us? Please share our site to one of your friends if you have time, thank you! Mike, thanks for your efforts with this project. Finally an Instragram feed project that does not require you to jump through all the API hoops just to show my feed [thumbs-up]! I do have a question, All of the images being called up are being formatted in a square format. Unlike Teddy Georgia Waggy issue, I’d like to have the images render in their native format (i.e. if they are portrait, show portrait and if they are landscape, show landscape). Currently, all images regardless of their orientation are being produced in the square format (adding white space above/below or left/right based on the orientation). Is there code that can be added/adjusted to produce this? The reason I’m asking… I have an adjustable image grid application I created that is designed to allow portrait/landscape images to live together. I have a working demo of my application using your core code here; http://edhathaway.com/instagram-gallery . The long & short of my question is… is there a way to display the ‘native’ image without it being squared? Thanks again! Hello @disqus_amRBhZc7Ga:disqus , thanks for the kind words! About your question, my answer is in section 10.0 above. You’re welcome. Mike, Thanks for your assistance regarding my issue. However, I have an FYI that might be of assistance to you and/or your users regarding the ‘client token’. If you use the website link mentioned in Step 3.0 and you have ‘no’ or ‘multiple’ registered Instagram client apps, the client token you get in return is not assigned to anything other then your specific username account. Thus, all you can render are the squared image format. To get the correct ‘client token’ specific to one of your active Instagram apps you need to use this URL; https://api.instagram.com/oauth/authorize/?client_id=CLIENT-ID&redirect_uri=REDIRECT-URI&response_type=token -Replace the CLIENT-ID and REDIRECT-URI with the data from an active Instagram app and you’ll get a ‘client token’ that is assigned to this specific Instagram app. From here you can adjust this Instagram client app settings (i.e. show non-square images) as needed. By following these steps I was able to get my extension to show my Instagram images in their native format. With this, everything is PERFECT! Again, thanks for your great code and I’ll be purchasing your 2nd level offering because your efforts need to be rewarded. Hello @disqus_amRBhZc7Ga:disqus , thanks for providing this information, I appreciate it! However, I wonder how that link still works for you, we previously used that method and many people emailed me that it does not work anymore. Did you do something special? Did you submit your client to Instagram and got approved? We are using the sandbox mode in the tutorial above. Thanks for your intention to support our site by purchasing our source code, I really appreciate it! Mike, if you include the ‘http://’ or ‘https://’ in your authorized domain name (in the Security tab of your Instagram client app) and include this into the path I posted above… you’ll get your access token. I have 5 Instagram client apps and I was able to get a unique access token for each and all worked. Now, I’m not sure how long Instagram will allow this to work but for now and for me, it works unlike using the posted URL (step 3.0) that does not bind to a specific client app. I’d be interested to hear from you or others if this works on your end. @disqus_amRBhZc7Ga:disqus ‘http://’ or ‘https://’ is already included in my client but it still didn’t work. What I did was Edit > Security Tab > Uncheck ‘Disable implicit OAuth’, I did not see this option before. It did not work. Any suggestions? Mike, suggestions… no! Facebook is trying their best to push Instagram’s API as far away from website developers who just want to show their feed. What a shame – IMHO. I did some digging around on the ‘Pixel Union’ site and found that the button you click onto to get an ‘access_token’ is using a very mildly modified URL that I posted above. Their URL is; https://instagram.com/oauth/authorize/?client_id=CLIENT_ID&redirect_uri=REDIRECT_URL&response_type=token -Using this URL (making sure to include your CLIENT_ID & REDIRECT_URL) will ask you to authorize your request (because being in sandbox mode) and once authorized, will push you back to your registered ‘redirect URL’ with a working ‘access_token’. So… for now, either URL will generate an ‘access_token’. Remember… make 100% sure the ‘Disable implicit OAuth’ checkbox is NOT checked or you’ll get an error (as you found out). @disqus_amRBhZc7Ga:disqus , it looks like it works for me now. The feed it fetches is the feed of API client owner. It seems like it cannot be used for other Instagram accounts. Anyway, I think the instructions on our blog above works for people who does not want to create an API client and prefer the square images. But I’ll add the instructions for people who need the original aspect ratio as well. Thanks for all your help! Can I make api call from iOS app and load the json reponse in my app using your code? Hello @Kalpit, you can imitate the how the JSON url above was constructed using your code in your iOS app. Then you can parse the JSON response using your programming language. I noticed this code is causing a 5-6 second TTFB on my site, is there any we can use a $(document).ready on it or call the json with jquery so it doesn’t prevent the server from responding? Hello @arshad_arsal:disqus , we are unable to replicate you issue. It works on our localhost AND web server as seen on our demo links above. Let us know the exact error message you encounter so we can try to solve that. Hello am trying to add an instagram feed on my website but the photos are not showing, what could be the problem please need your help? Hi @ruth_asiimwe:disqus , please post the error message you encounter. Make sure your server support JSON and allow_url_fopen. Hello @ninjazhai:disqus I have used that link and its not helping me, because i don’t want to display my Instagram information, I want to display only five photos to the website from my Instagram thanks for your later reply. The website plugin have options to hide your Instagram profile information and limit the number of photos to 5. Hi @rodrigozuluaga:disqus, Instagram API can only render 33 photos at a time. Hi @Corsari:disqus, thanks for sharing the link! It’s good to know about the API changes. But the goal of our tutorial above is only to display Instagram posts on a webpage. The tutorial still works as seen on the live demo. @Corsari:disqus, I see your point, thanks for your suggestion! I’d like to post a comment there but the thread was closed. I’ll reach out to CSS Tricks and try to post a content like this there soon. The tutorial only covers the LEVEL 1 source code. If that’s not good enough and if you need more features, you may support us by downloading the LEVEL 2 source code. Thank you! ty for the nice Tutorial. Can u say me how i can get the Instagram Posts filtered by Hashtag, not by User ?